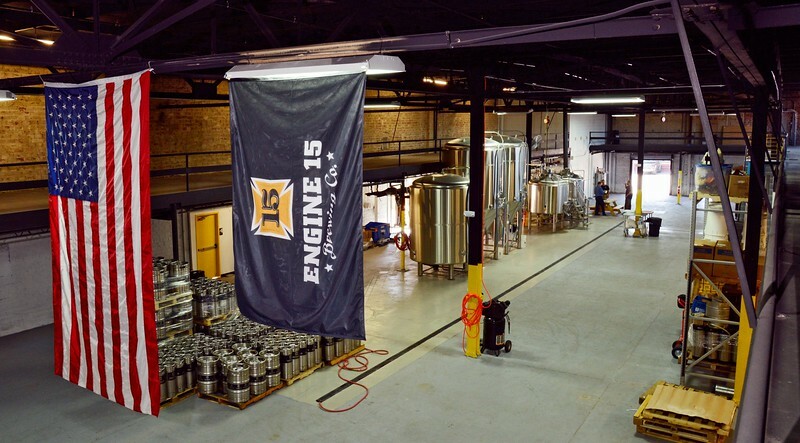 Locally-grown, specialty manufacturing company Engine 15 Brewing is proceding with plans of turning an industrial facility west of downtown Jacksonville, into a unique urban beer garden now that the property has been re-zoned to allow for on-site retail sales. The area surrounding the brewery could be poised to become a Southeastern version of Pittsburgh’s Strip District or Detroit’s Eastern Market if zoning rules can be relaxed on similar sites nearby. 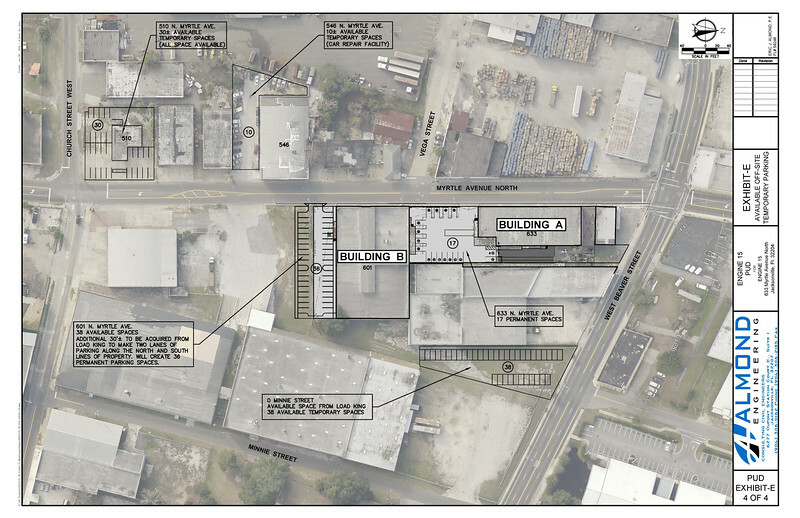 On Tuesday night, the Jacksonville City Council approved the rezoning of Engine 15 Brewing’s new facility, at 633 and 601 Myrtle Avenue, to allow for onsite sale and consumption of beer produced by their existing brewery and cider production facilities. 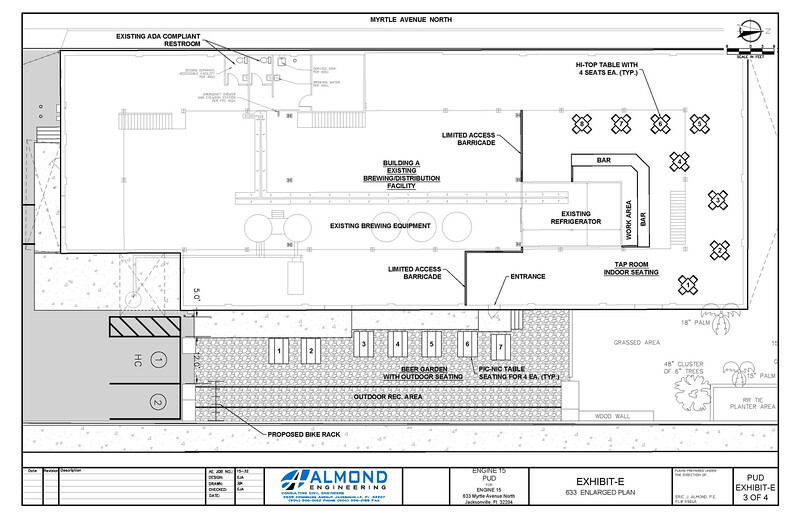 This rezoning, a use not allowed for in buildings zoned under the Industrial Light designation, allows the proprietors of a home-grown microbrewery in the midst of an impressive expansion to proceed with plans to turn their production complex into a hybrid facility that will also house an indoor taproom, a unique outdoor beer garden and a stunning event space in order to create a unique destination convenient to the downtown urban core. The northern building (BUILDING A) currently houses brewery manufacturing and distribution process equipment. The 25,000 square-foot southern building (BUILDING B) houses a small cider production operation encompassing approximately 1,000 square feet. Engine 15 intends to construct an informal tap room within Building A. This space would be located in a small distinct location in the building’s northern section. It would include an outside seating area with a small outdoor recreation component (i.e. bocce ball court, large chess court, horse shoe court, etc.) for the enjoyment of their guests and clients. Ideally, the tap room ideally would be a “fair weather” establishment open during periods of enjoyable weather and off peak hours for the manufacturing and distribution operations of the current building. It is not anticipated that the tap room would be open year round; rather the tap room would be seasonal, weather permitting, open only several days out of the week. The use of Building B is only to provide a common communal space for special events that occur only a few times during the year. As former light industrial sites in the Brooklyn neighborhood are razed to make way for new multi-family housing development and alike North San Marco sites are poised to see similar redevelopment upon the Overland Bridge project, the area bounded by Myrtle and Beaver represents one of the last remaining areas within the central city that could support expanded economic growth defined by specialty manufacturing operations.